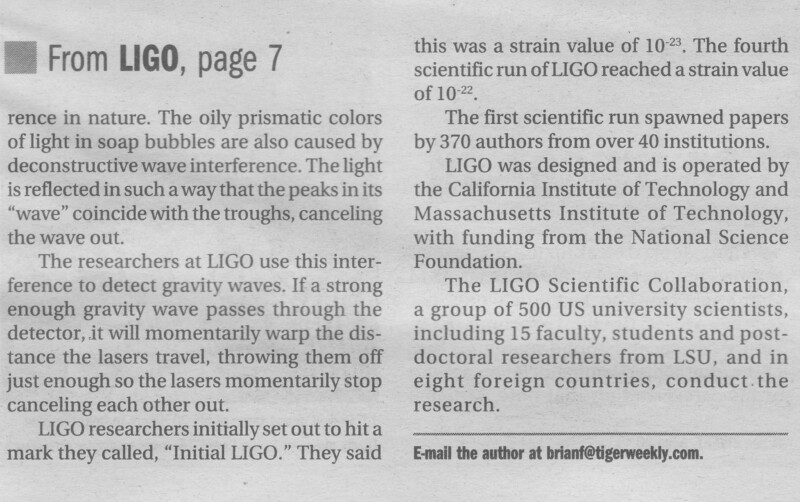 They call it LIGO. In the past, others, Albert Einstein included, merely called it impossible. LIGO, which stands for Laser Interferometer Gravitational-wave Observatory, is a roughly $400 million ongoing project. Its purpose is to detect gravity waves. Scientists often compare gravity waves to electromagnetic waves like radio waves and light. But, this is the dumbed down explanation. Einstein envisioned the entire universe and its four dimensions, height, length, depth, and time as a kind of rubber sheet or a trampoline. If one puts a bowling ball on a trampoline, the mass of the bowling ball warps the canvas. If one then puts a tennis ball on the trampoline it will roll towards the bowling ball, because of the warping of the canvas. The warping of the canvas is similar to how mass warps space-time. 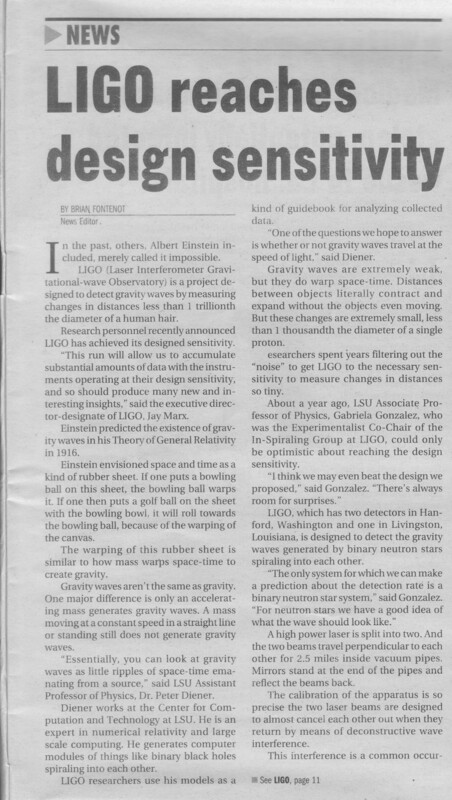 Gravity waves aren’t nearly so easy to explain. They are often confused with gravity, itself. One major difference being only accelerating masses generate gravity waves, while any mass generates a gravitational field. Diener works at the Center for Computation and Technology at LSU. He’s an expert in numerical relativity and large scale computing, which is a good thing, as he is tasked with generating computer models of things like binary black holes spiraling into each other and what the gravity waves generated by them would look like. LIGO researchers use his models as a kind of guidebook for analyzing collected data. This is not a simple task. Gravity is easily near the top of the list of least understood natural phenomena. 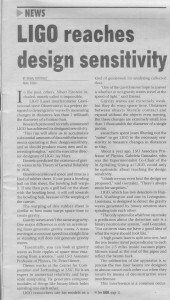 But with LIGO and advanced computer modeling, Diener and his colleagues hope to find some answers. The interesting thing about these relatively weak gravity waves is the fact they warp space-time. Distances expand and contract, minutely, as these waves pass by. So, a meter stick would be as long as a meter, but wouldn’t be as long as a meter. Yes, it is confusing. LIGO, which has two detectors in Hanford, Washington and one in Livingston, Louisiana, is designed to detect the gravity waves generated by binary neutron stars spiraling into each other. It does this by shooting a high power laser into a beam splitter, which cuts the beam into two. The two beams, which are sealed in a 1m in diameter pipe, travel out perpendicular to each other for 4km. At the end of the two 4km pipes are mirrors, which reflect the beams back down the pipes, back to the splitter. This is where things get nuts. The apparatus is so precise the two laser beams are designed to cause deconstructive interference with each other, canceling each other out. This interference is like pushing someone on a swing as they are coming toward you and not while they are going away from you. The result would be the person pushing and the person swinging, clobbering each other. This interference is commonly seen in the rainbow colors made by oil and soap bubbles. 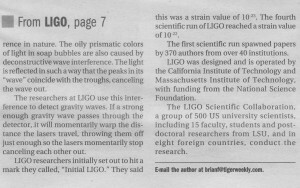 The researchers at LIGO use this interference to detect gravity waves. If a strong enough wave passes through the detector, it will actually warp the distance the lasers travel, throwing them just enough out of the deconstructive phases they are in to emit light. This level of precision is absolutely necessary when you’re trying to measure a change in distance caused by a gravity wave, which is roughly 1/100,000,000 the diameter of a Hydrogen atom. Dr. Gabriella Gonzalez, an Associate Professor at LSU, who is also the Experimentalist Co-Chair of the In-Spiraling Group at LIGO, mainly deals with setting up this insanely precise apparatus. She does things like making sure the mirrors are as close to perfectly aligned as possible. She is also an expert on the sensitivity of LIGO and what is able to detect. The researchers are working everyday to make the system more precise. They’ve spent the last few years just screening out noise sources like seismic disruptions. They’ve set out to hit a mark they call “Initial LIGO” which is a strain value of 10-23. The last scientific run of LIGO, the fourth scientific run, reached a strain value of 10-22 and the last run was made back in January 2004. Keep in mind, the first scientific run spawned papers by 370 authors from over 40 institutions. The data from the second and third runs is still being analyzed. LIGO2, which is an upgrade to the current LIGO systems, is expected to increase the sensitivity of the system by a factor of 10, which puts the range of the detector out to the Virgo cluster. Currently, NASA and the ESA (European Space Agency) are in talks about constructing and launching an orbital version of LIGO, called LISA, which would be able to measure the gravity waves generated by the super massive black holes at the center of our galaxy.